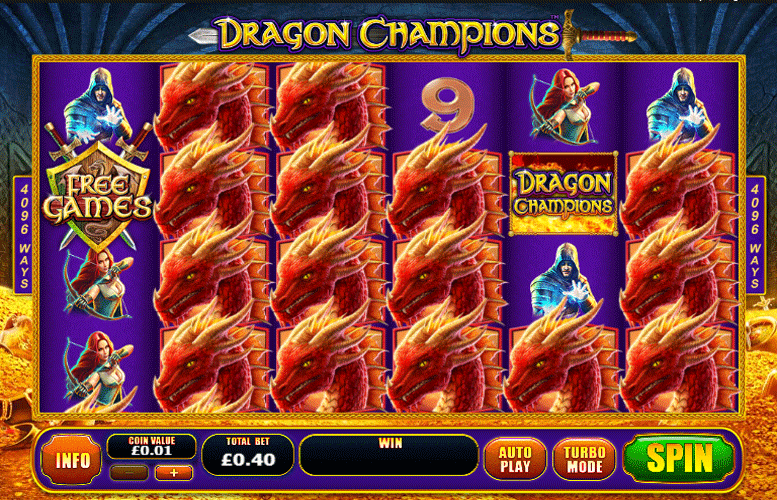 The Dragon Champions slot from Playtech is all about epic quests to battle mythical beasts for riches. It’s a strong theme and the artwork and music lend themselves to the subject matter. Having said that, it would be more fitting if the symbol and background design were more grandiose. In terms of gameplay dynamics, the most striking is that it is played on a slightly irregular grid. Rather than the standard 5×3, this one is 6×4. This means that there are a massive 4,096 ways to win on it. The designers elected to do away with traditional pay lines in favour of this novel approach and it certainly adds to the slot’s appeal. Then there’s the free games mode. It’s possible to win an incredible 100 free games. That alone makes Dragon Champions worthy of a few spins. An innovative grid layout makes Dragon Champions feel fresh amongst a sea of titles which often share overly similar gameplay dynamics. Interesting bonus feature that we’ve never seen on another machine. Can win an incredible 100 free spins. With so many chances and ways to win, players are practically guaranteed to walk away with a prize! Very low upper betting limit. It’s possible to bet several thousand pounds per spin on many machines. This makes the highest bet on Dragon Champions look measly in comparison. No second screen bonus stage. All the action takes place on the oversized grid. This can mean that the replay value of Dragon Champions is not as strong as it might be. Dragon = 400x the total bet. Sword bearing warriors = 200x the total bet. Archer or sorcerer = 160x the total bet. Any symbol that lands with blue dragonfire can expand in four directions. The dragonfire appears at random and can effect any symbol in the main game. This excludes “wild” and “scatter” symbols, however. Players should note that dragonfire symbols can only expand if they can create or improve a winning combination. Landing three or more free games symbols anywhere on the reels will trigger free games. 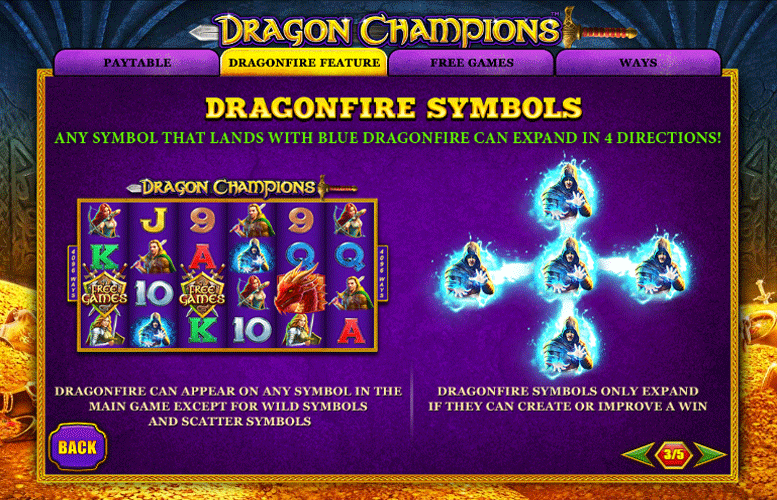 During these games, all dragonfire symbols are the highest value dragon’s head symbol. Whilst the free games mode is active, an additional two or more free games symbols anywhere on the reels will trigger extra free games. Six symbols = 100 free games. Five symbols = 25 free games. Four symbols = 15 free games. Three symbols = 8 free games. Two symbols = 5 free games (retrigger only). As noted, there are 4,096 ways to win. There are no win lines per se, so winning combinations only require matching symbols anywhere on consecutive reels. If three or more symbols match on consecutive reels, a prize will be awarded as per the payments listed above and below. Ace, or King = 120x the total bet. Queen, or Jack = 100x the total bet. 10, or 9 = 80x the total bet. 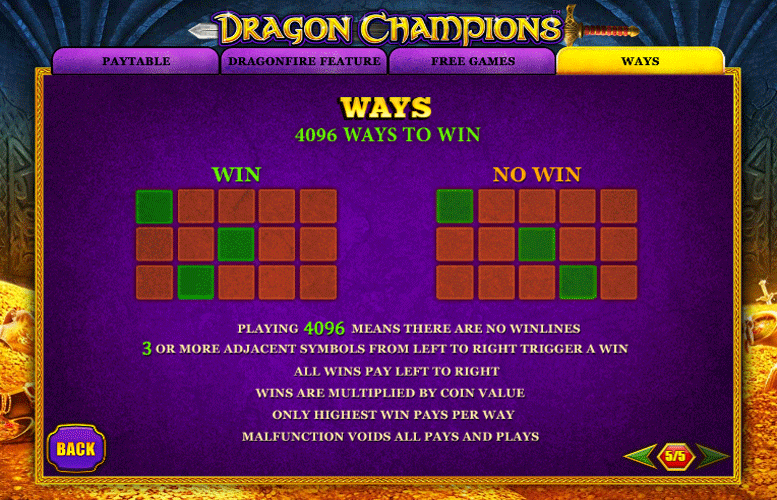 Being as it uses such a novel grid, players are limited as to how they can spread their bets around on Dragon Champions. It is only possible to raise or lower the total bet amount. However, for the sake of pricing, the game uses an assumed 40 win lines. This means that with the lowest possible coin value of 1p, the total bet will be just 40p. Meanwhile, with the highest value of £2 set, the maximum bet per spin is a lowly £80. 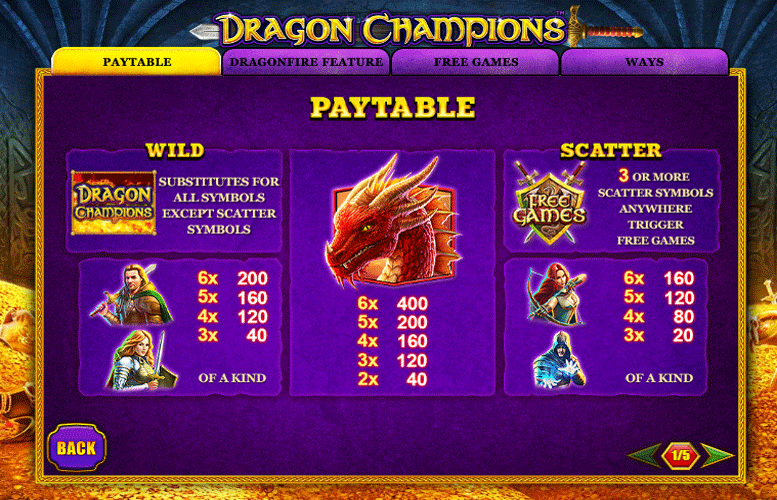 Evidently, Dragon Champions has not been designed with the highest rollers in mind. All things considered, Dragon Champions is a solid machine. On the looks and feel front, it hardly wows but the design is strong enough that it doesn’t detract from the game’s enjoyment. Unfortunately, the main game prizes and upper betting limit are somewhat low. This, when coupled with a lack of variety in the game’s features, does let the Dragon Champions down. However, when you consider the fact that there are up to 100 free spins up for grabs, the appeal of the title is obvious. This game has a rating of 4 / 5 with 384 total reviews by the users.